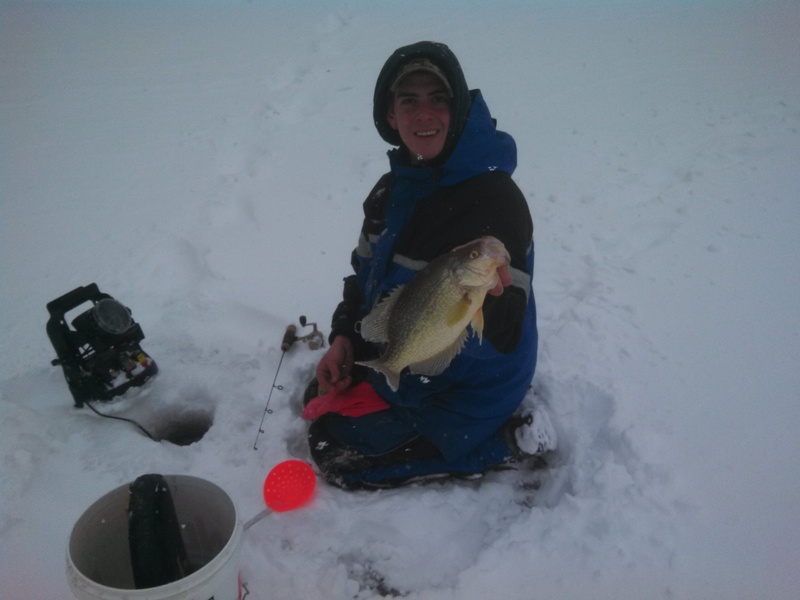 2-12-13 – Perch, Bluegill, And A Giant Pumpkinseed! 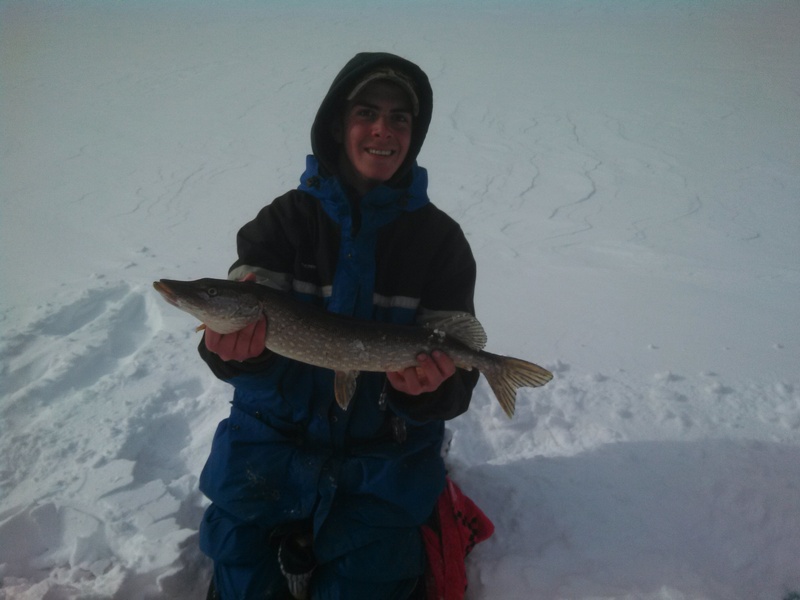 I got out on the ice with a buddy from college today that I don’t get to see a ton. He drove down to my house in the morning so we weren’t on the ice before sunrise like we should have been. In the end, it didn’t matter all that much! The weatherman said we would start the day with some rain but by mid day the sun would be shining. Boy was it ever! Arriving at our fishing spot around 7 am, the fog was so thick we couldn’t tell if we would be fishing alone or with a group of people. The walk out to the spot took some time but when we got there it only took a few holes to find the highly mobile school of jumbo perch. There were some people around us and most were picking a few fish. As the morning wore on, the fog came and went revealing the numerous people that were out there looking for the same gold we were. 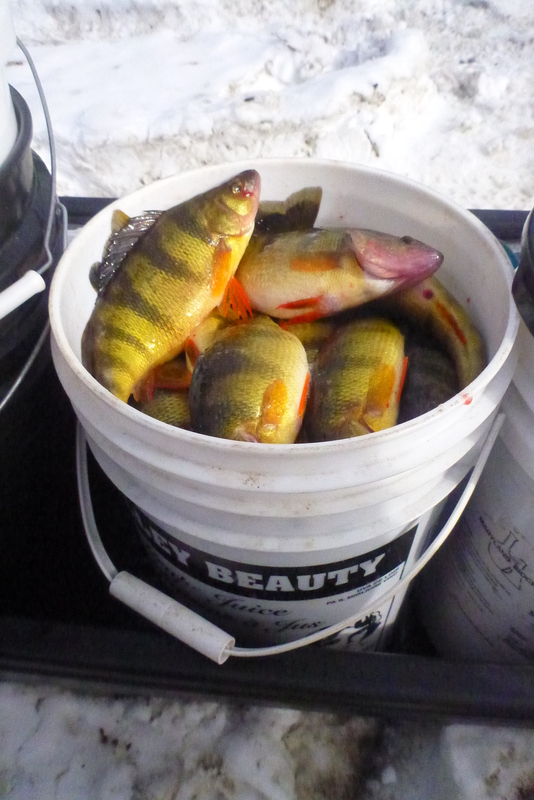 After about three hours, I topped off my 6 gallon bucket with my limit of 50 perch. 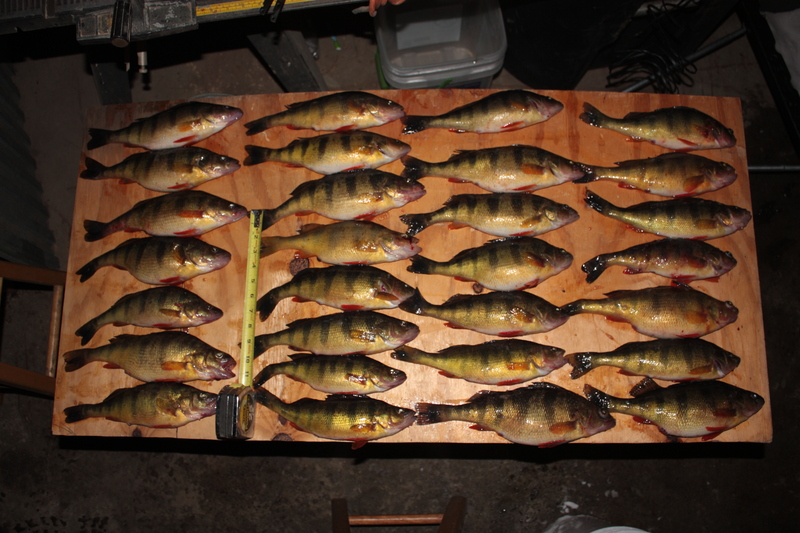 The perch were nice, a size smaller than the day before but still quality. Most of the fish today were male which might have made up the difference between the two days. I caught the majority of my fish on a orange/white glow horizontal jig. After catching about 30 fish I lost my last one and switched to red. There was a significant change in how aggressive the fish were but I was still able to make things work. 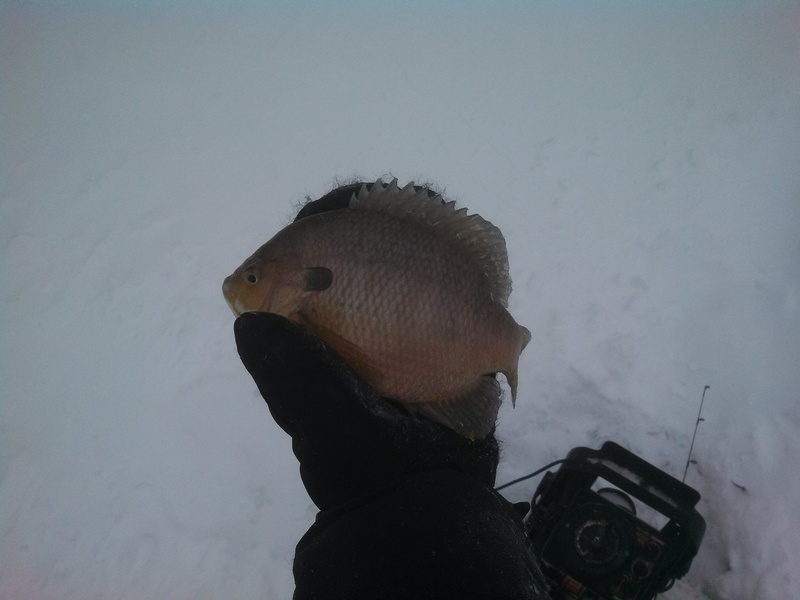 After my perch fishing was done, we switched locations with the intentions of hounding the bluegill and pumpkinseed the remainder of the day. I asked my buddy if he was interested in looking for new fish or fishing a weedbed that I had previously located. He opted for the adventure. Luckily I had a clue as to where to start. Unfortunately, this weeds on this lake tend to change dramatically so the fish move year to year. After punching a series of holes, I gave him a run through on how I fish and what he should expect. While giving the tutorial, we got a clue as to how spot on we were with the holes. The first two holes I punched were loaded with fish! Fish after fish, it was a while before either of us had to move. 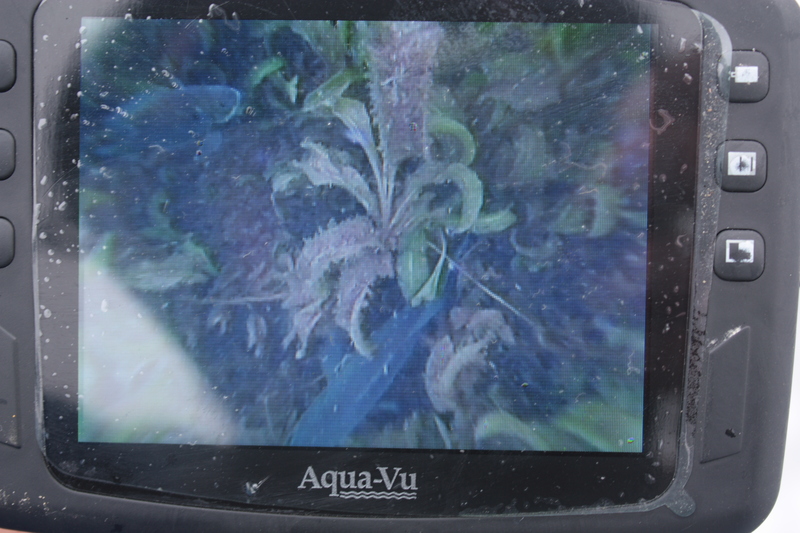 As we moved around, we located weed edges and at what depth the fish were holding. When we located fish they were very aggressive so fishing this afternoon was a blast! As we fished hole to hole, we tended to work parallel with each other noting where the fish were moving through. As we reached the end of our holes I set the hook on a fish that put up a fight like a smallish bass. 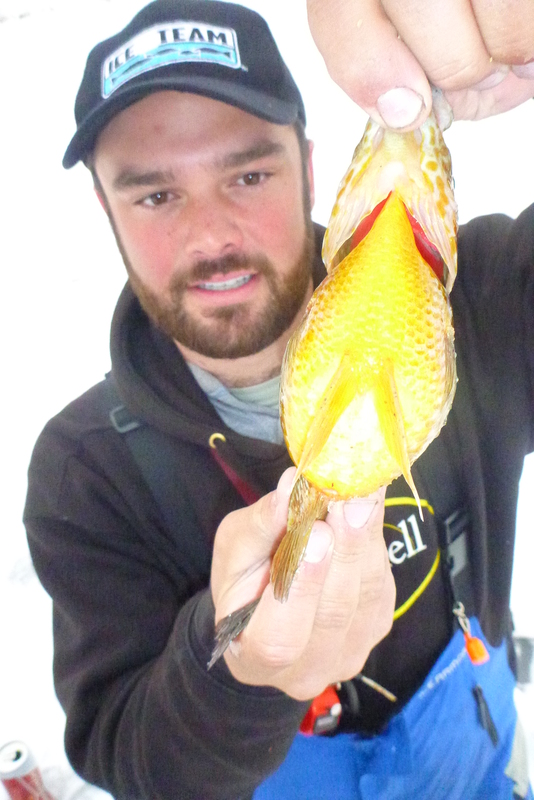 As it came through the hole, I realized that I had caught the biggest pumpkinseed I had ever caught. The belly of the fish looked like it had eaten two golf balls. 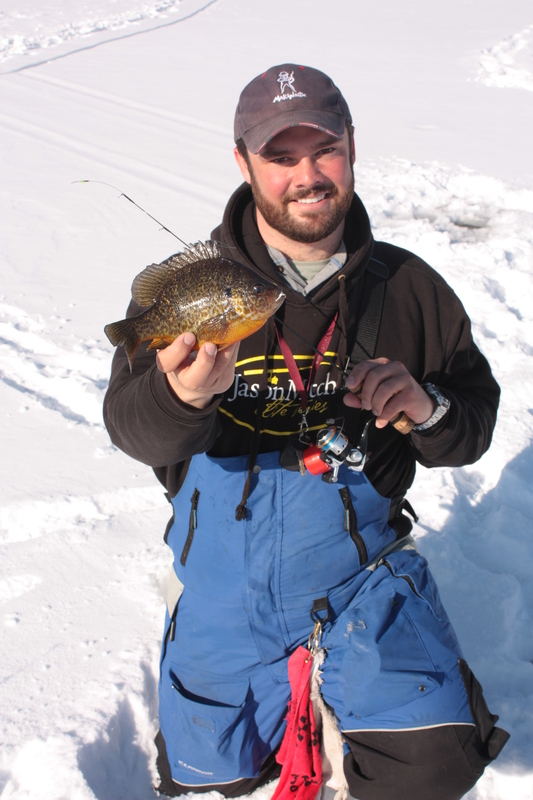 Overall the pumpkinseed was only 9.5″ but it was so thick it made my day. Even more so than the bucket of perch in my truck! After a few pictures, the fish was released for another day. We caught a ton of largemouth and rockbass today. 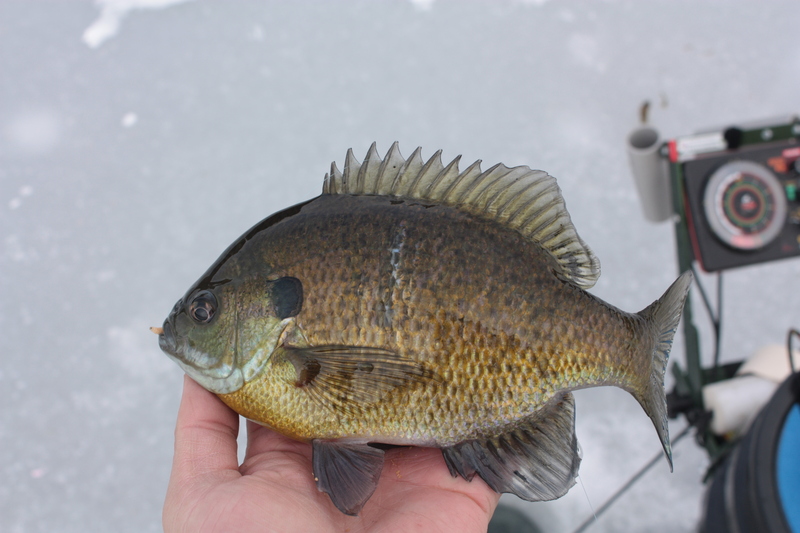 They were mixed in evenly with the bluegill and pumpkinseed but more aggressive. After Dylan’s successful day of perch fishing, I met him after work for an attempt at an afternoon/night bite for walleye. Walleye fishing isn’t a new task for us, however, catching one through the ice had not yet happened. We did a little research and depth, location and hit the ice. We cut our holes along a large inside turn on a setback that is known to hold some winter walleye. We staggered our depths between 3 feet of water to 12. 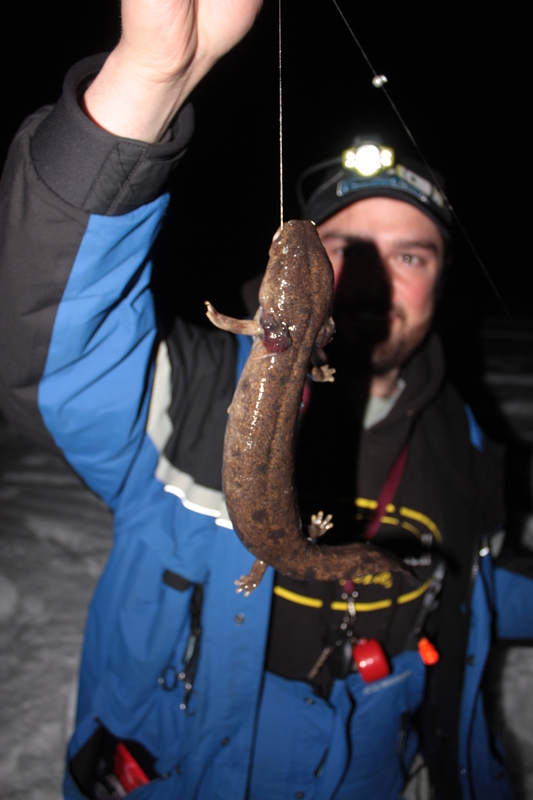 Along with staggering our set up depths we also varied the depth we were setting the bait. Being new to this, this would allow us to see what presentation was best if the fish decided to cooperate. We also used different sized shiners in hopes maybe that would lead us to a more efficient technique. 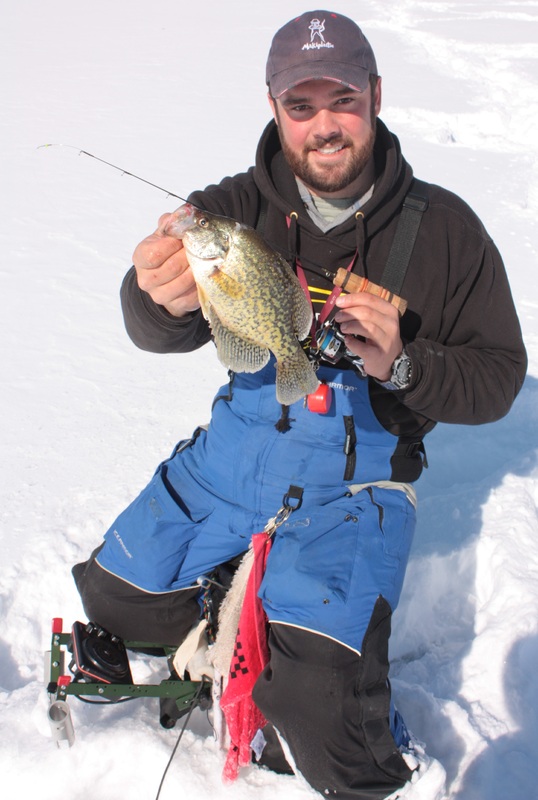 With our jacks sets and soaking, we drilled a few more holes and began jigging for crappie since this spot holds good numbers of them. The crappie fishing was slow, very slow. Fish were marked but mostly sniffers and only a few were caught. After hanging up my phone with a good friend and avid walleye fishermen and receiving a few tips on how the walleye will act when he strike we sat and waited. Around 4:30 pm a flag went up. The fish made two runs, not long runs but descent runs, the line went slack. By the time I picked up the line to make a move the fish had dropped the bait. We re-baited and starting waiting again. At 5 pm on the dot the second flag went up. This time we didn’t make the mistake of waiting too long, as our friend told us that a walleye isn’t usually going to run too far with the bait. After the first run the line stopped, I pulled in the slack and noticed that the fished seemed to be circling the hole. This is another tell tale sign that there is a walleye on the other side. Hook set, decent fish up through the hole. . . .WALLEYE!!! Our first walleye through the ice! Not a huge fish but a decent 17 incher. The next flag came up shortly after, Dylan was up to the plate. We came to realize that these fish are somewhat difficult to hook, no hook up, and then another flag with the same result. All in all the trip was a success. We learned a lot, enjoyed the night on the ice and were able to land our first walleye through the ice. We will defiantly be honing our skills in the near future. PS The big surprise of the night came when we were picking up to leave. A tip up that Dylan was pulling in had a big mud puppy on the other end. See the third picture. 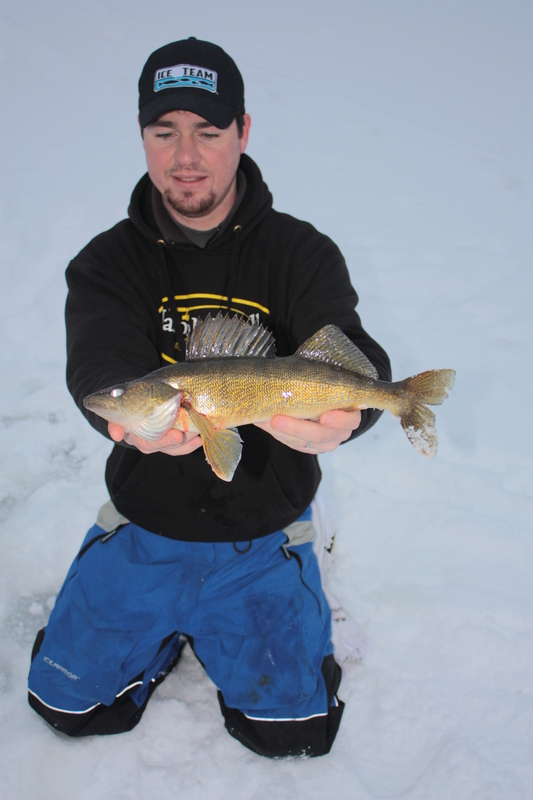 Check out First Walleye Through The Ice on our YouTube page for more action! I slept in this morning waiting on the weather to either quit or for a break in the snow, sleet, and rain. The snow came down most of the morning and was suppose to switch over to sleet for the mid day. Not wanting to get stuck away from home for the night, I hung around home and caught up on errands. When I checked the weather report around 8:15, it looked a bit more promising so I headed out. Arriving at the lake, I intended to fish for bluegill and pumpkinseed. After looking for a new weedbed to fish for a bit, I couldn’t find them because of a lack of tall weeds and called it quits. I knew that because the day was so overcast and with a bit of precipitation coming down, the fish would bite well if I could find them. 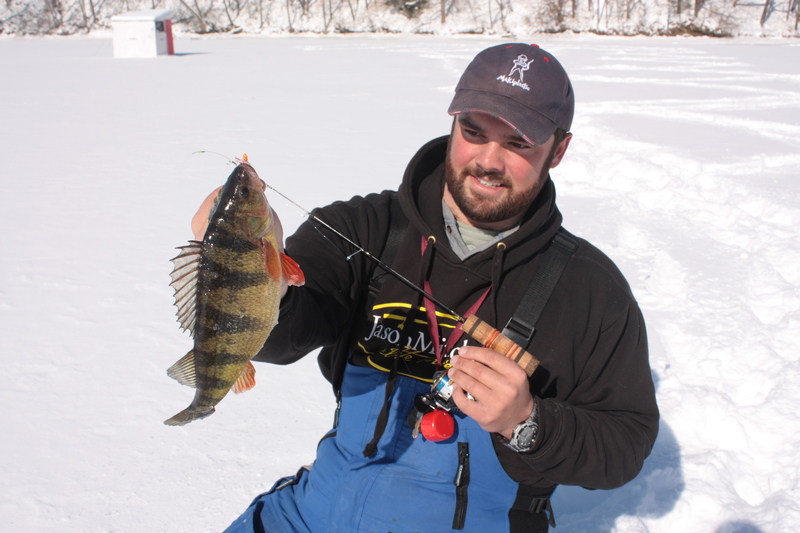 I headed deep to look for the jumbo perch that I know are in the lake. By the time I had to pack up and pick up minnows for the trip tonight, I had 28 fish in my bucket. For a mid day, winter perch bite on this lake this trip was exceptional! 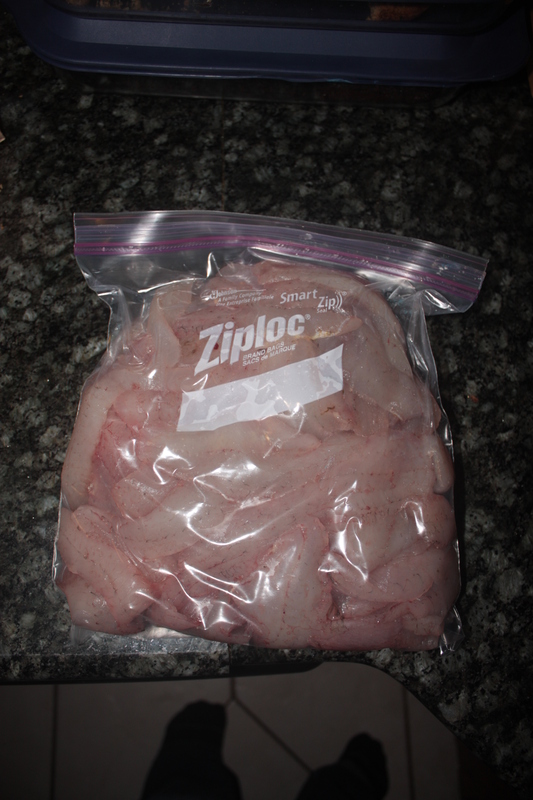 I got 56 big fillets for the freezer. In a few hours Bobby and I were set up waiting for walleye. After 3.5 days with no fishing, it was back to square one with finding them. A buddy and I hit the road early hoping for a morning bite. We were on the ice before it was light out and the temperature was below zero. Because there was no wind, it didn’t feel overly cold. The fishing was pretty slow. We worked over most of the fishable area without ever finding a high concentration of fish. A good hole would consist of pulling out two fish back to back. The longer we fished, the more frustrating the slow bite was. 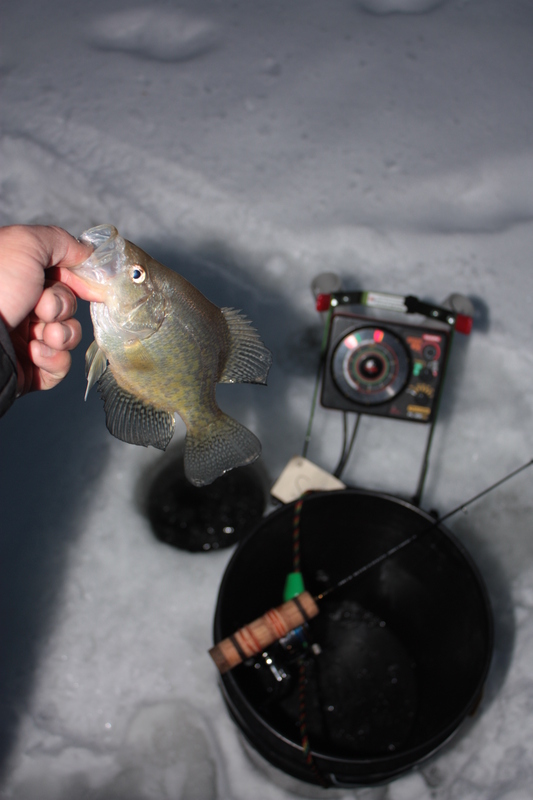 With a good meal of big perch in each of our buckets and a few kicker crappie, we decided our best option was to head out and hit a different pond in search of bluegill and pumpkinseed. After making the commute, we found fish in no time. The weeds were short but the fish weren’t easily spooked when we punched holes. They were cruising anywhere from a few inches to 3 feet above the weeds. Most holes would allow you to catch several fish before having to move on. It was a great way to wrap up the day that started slow. The fish were aggressive when you were on top of them. 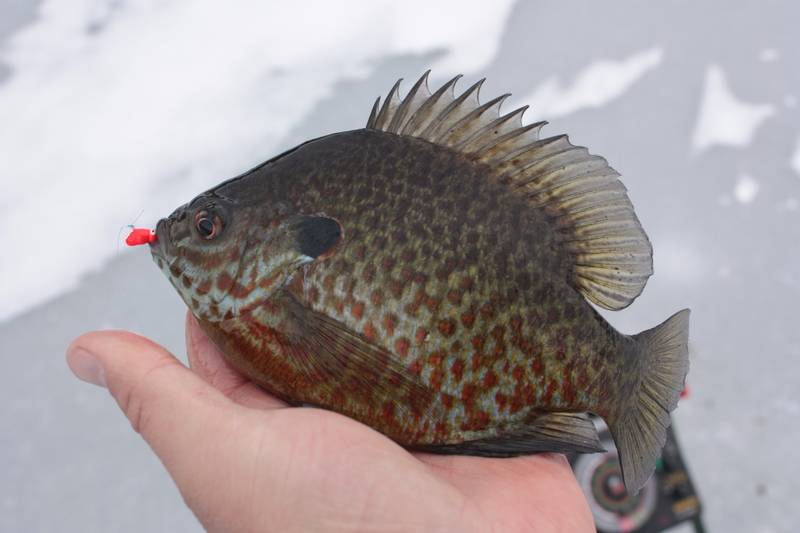 The bluegill were cruising high enough to see plainly on the Vexilar but the pumpkinseed were a bit different. For them, you had to pull them out of the weeds which wasn’t that difficult. All I had to do was work my jig down into the short weeds for a second then raise back up suspending a foot above the weed tops. If they were in there they charged up with no concern. The color didn’t seem to matter much. Quite a few bass were in the area so I had to re-tie a few times. I used red, white, and orange and they all worked equally well. Mainly, I used maggots for bait. I tried plastics for a bit but the fish seemed to be just nipping at the tail. The meat made them bite and hold on. 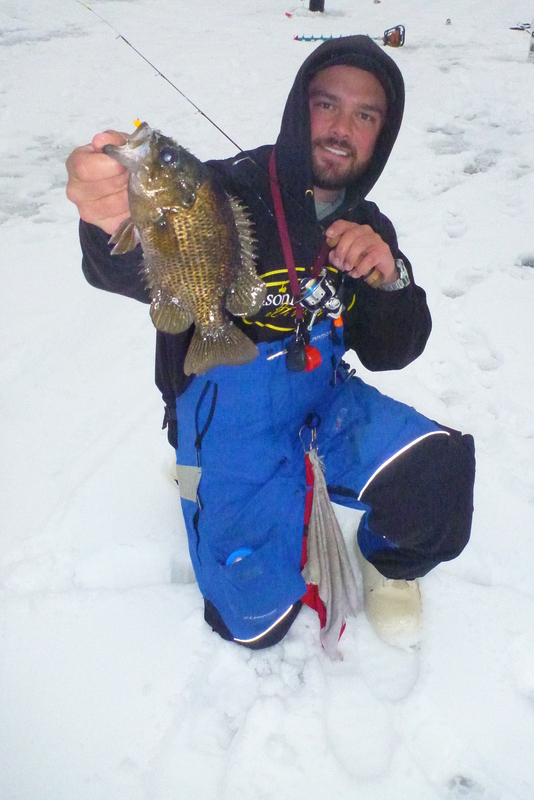 Check out Afternoon Gills on our YouTube page for more action!